The global enterprise networking market, in the years to come, is anticipated to be majorly driven by the surging demands for real-time & secure communication between devices due to booming connected device sales. Global enterprises, in an effort to overcome the escalating bandwidth bottleneck and network traffic issues, are adopting network management solutions for managing rising network traffic while also ensuring an enhanced network security. Moreover, with an exponential rise in the use of a plethora of different Internet of Things (IoT) devices fueling the rise of a diverse array of security risks that are usually associated with IoT devices that are unsecured, companies are rolling out enterprise network security solutions to secure their respective organization’s network and obtain visibility of endpoints as well as unsecured applications & devices. The global enterprise networking industry will also be acquiring sizable gains due to consumer preferences which are shifting towards converged infrastructure (converged network architecture) as well as towards network visualization technology implementation to merge the network functions together, allowing businesses to reduce their operational costs and improve network efficiency. With the exponentially growing adoption of mobile devices such as smartphones, laptops and tablets, companies have begun integrating these devices to the organizational network. Indeed, the global enterprise networking market would witness sizable growth from the surging sales of these devices, attributed to the increasing complexities as well as the added security provisions that have to be implemented to allow employees to use a mobile device for accessing the company’s valuable business data without jeopardizing the safety of the information stored on the company’s network. The significant potential for mobile networking would thus ensure sizable gains for the market over the years to come, through accelerated efforts from global tech firms to capitalize on the trend by enabling mobile enterprises. The partnership between Apple & Cisco is one such example where both firms are collaborating to facilitate the deepest level of control & visibility for enterprise-owned Apple devices, further allowing businesses to boost iOS adoption in their respective enterprise networks and eliminating potential obstructions brought up by security & audit concerns. The North America enterprise networking market is projected to witness significant growth in the years to come, a feat that can be credited to the increasing prominence of myriad cyber-threats and attacks in the region. According to a study by the Center for Strategic & International Studies (CSIS), since 2006, North America recorded a massive amount of significant cyber security incidents – mainly from the United States, which by far witnesses the greatest number of cyber security incidents as compared to other nations by a wide margin. According to The Heritage Foundation, no other form of threat in North America has grown as rapidly or in a more difficult to comprehend manner as the threat posed by cyberattacks. The 2016 Cyber Security Intelligence Index report by IBM claims financial services, health care and manufacturing are the three most targeted sectors due to the vast quantities of personal as well as potential monetary data that defines these domains. This would consequently be responsible for the accelerated adoption of new as well as upgraded enterprise networks in the region, facilitating the expansion of North America enterprise networking industry. Powered by the irrefutably accelerated surge of connected devices across the globe, the demand for secure real-time communication will only serve to escalate in the years to come. 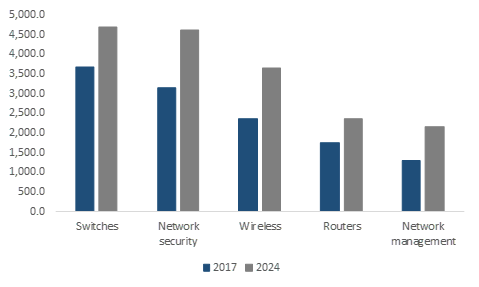 As organizations continue to adopt enhanced network management solutions to drive efficiency and ensure network security, the overall enterprise networking market size is anticipated to be pegged at a mammoth USD 90 billion by 2024.